The other Taylor thermometer, an old, mechanical, mercury-filled, min-max thermometer keeps the digital thermometer honest. What it lacks in convenience (no beaming from this thermometer) it makes up for with accuracy. Good thing, too, because for all its convenience, the digital thermometer is often — perhaps always, I’ll have to check — 5 degrees out of whack. Five degrees is a lot when I want to know if frost descended on the garden some early spring night or want to brag honestly about how cold temperatures drop here in midwinter. My mudroom is unheated but maintains relatively moderate temperatures by sharing a wall with the woodstove-heated living room. As such, it’s something like a giant refrigerator, a good place, certain times of the year to store potted plants, scion wood, and boxes of fruits, vegetables. But how cold, or warm, is it in there? Another old, mechanical, mercury-filled, Taylor min-max thermometer keeps me posted on conditions in there. My basement is barely heated and has a Bilco door entrance that I re-built out of wood with a clear polycarbonate plastic cover to make a very cool (temperaturely speaking), bright place to overwinter plants. Gotta measure the temperatures there, of course, for the plants and, back from the bright area where I have stored home-made beer and boxes of apples. More thermometers. For all the pleasure, in food, fun, and ambience, afforded by a greenhouse, it does bring it share of nail biting. One cold, winter night, I realized that the propane heater wasn’t kicking on; the gas company had forgotten to fill the tank. Now a weekly reminder pops up on my computer screen every Wednesday morning to remind me to check the gas level and call for a delivery if the level drops too low. Problem solved. 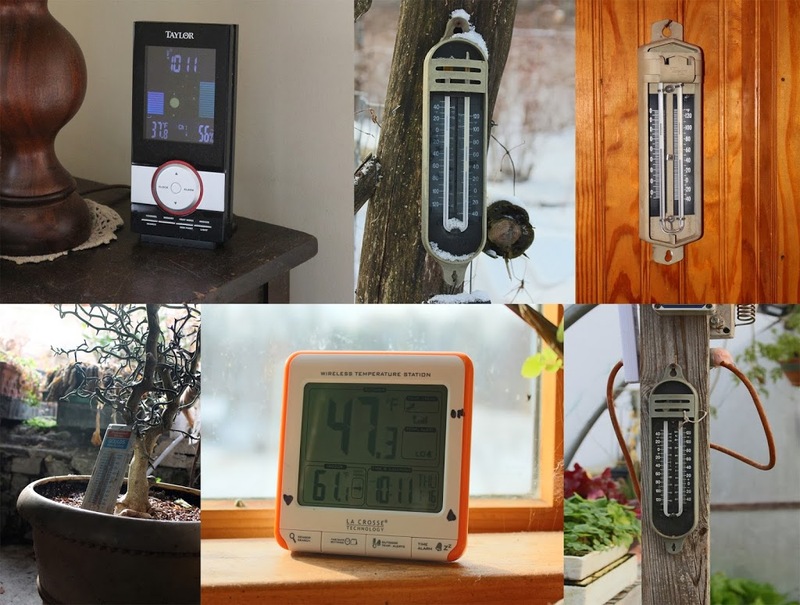 A bevy of thermometers –and that’s not all of them? On another cold, winter night, I again realized that the propane heater wasn’t kicking on when needed; this time the tank was full but the pilot light was out. Strong winds had created an updraft in the chimney, snuffing out the flame. A couple of holes drilled low on the pipe let some air into it to decrease the updraft. Problem solved. On yet another cold, winter night, I realized yet again that the propane heater wasn’t kicking on when needed; again, the tank was full and the pilot light was out, but this time it refused to be lit. The fault then was with the thermocouple, which turns off the gas if the pilot light goes out. I purchased a new thermocouple — and 3 more backups for future malfunctions — and soon a warm, tropical breeze was flowing from the heater. As further insurance for gas problems, I installed an electric space heater wired to its own thermostat. The electric heater should take care of any gas problems unless outdoor temperatures drop into the single digits, which would be more cold than the heater could handle. All the above precautions are for naught if the electricity fails — not a rare occurrence around here. The propane heater’s thermostat and fan gobble up a miniscule amount of electricity; miniscule though it is, the heater will not work at all without it. Got that covered now, with a deep discharge marine battery on a trickle charge that is wired to an inverter to convert the direct current to house current. Even the electrical backup is for naught if I’m not aware that the gas is low, the thermocouple needs replacement, the gas heater isn’t working, or the electricity is off. Enter the newest addition to my quiver of thermometers: the “La Crosse Technology Wireless Temperature Station with Trends and Alerts.” This thermometer wirelessly beams the greenhouse temperature homeward. Even better, this thermometer will wail if the temperature drops below (or above) a certain amount, which I set at 32°F. in the greenhouse. Of course, I can check the honesty of that thermometer against yet another old mechanical, mercury-filled, Taylor min-max thermometer that hangs in the greenhouse on a post with the La Crosse sensor. The La Crosse thermometer is new; so far it’s honest. Not to place too much emphasis on temperature (did I mention my compost thermometer, with its 2-foot-long probe sunk deep in the innards of one pile, or the small probe thermometer that monitors temperature within a seedling flat?) but temperature is not the end-all for how plants fare in winter. Temperature trends are important, as are temperature and moisture conditions going into winter. For instance, Asian persimmons grow in South Korea but not here; our winter temperatures are similar but the dry autumn weather of South Korea toughens plants up for the cold months ahead. My bamboo, Phyllostachys aureosulcata, came through last winter, when temperatures dipped briefly to -20°F., looking spry and lush. Single digit temperatures of the recent polar vortex burned all the leaves. With my thermometers, I may not be able to do anything about the weather (outside the greenhouse). But at least I can complain about it with authority. I’m in the process of setting up a weather station system myself. I want one that logs to a server, which will permit me to see pretty, granular graphs on your computer or phone/tablet, as well as store historical data for perusal at a later date. I think it will be interesting to see weather patterns going years back for my own house. As you’re s scientific minded guy, Lee, you may be interested in such a thing also. I was browsing what’s available today, and the acurite pro weather center looks like a pretty good deal. It can be had for $103 with the coupon code, and supports up to 3 sensors. Multiple sensors would also be useful for watching different locations microclimate patterns. Ooooo, that looks like something I need. I’m going to get one and report back. Excellent. I’d be interested to hear your take. I can’t vouch for the accuracy of the sensors, but they’re cheap enough. The coupon code is on their web site. The main downfall that I can see is that their website only stores 1 year’s worth of data. Hence why I’m building a custom weather station setup. Definitely keep me (us) posted on your work in developing a custom weather station.